Marcus and I are coming off a New Zealand high; a great adventure and a wonderful place to visit. The friendliest of people, beautiful sights and scenery, excellent wine and beer, and really great food. I don’t think we’ve ever had so much lamb in our lives, and that’s not a complaint! The seafood is abundant, it’s fresh and delicious. While we mainly ate white fish in New Zealand, like blue cod, snapper, and tarakihi, this gingery sweet and salty salmon is delish and totally hits the spot. 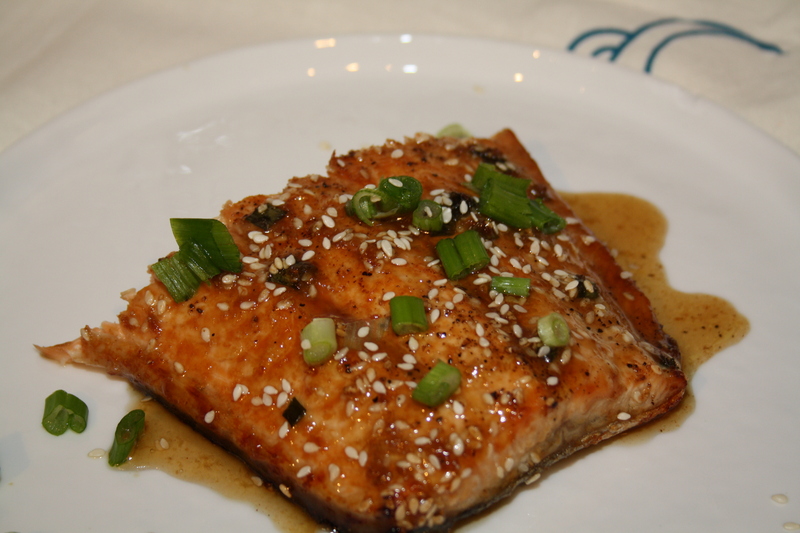 I’ve experimented with several Asian-style salmon recipes, and this is easily the best one. I was halfway through the recipe when I first made this dish and realized I needed to make a glaze. I’m the kind of cook where I don’t do a very good job of following instructions. 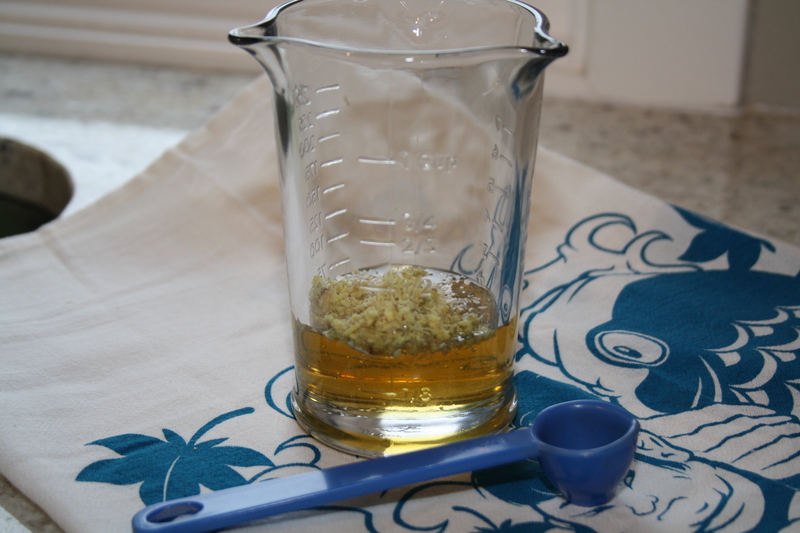 If there’s a sauce or dip or glaze in a recipe and I don’t feel like making it, I won’t. I was this close to not making the glaze, but since it’s so super quick and there’s little ingredients, I went for it. 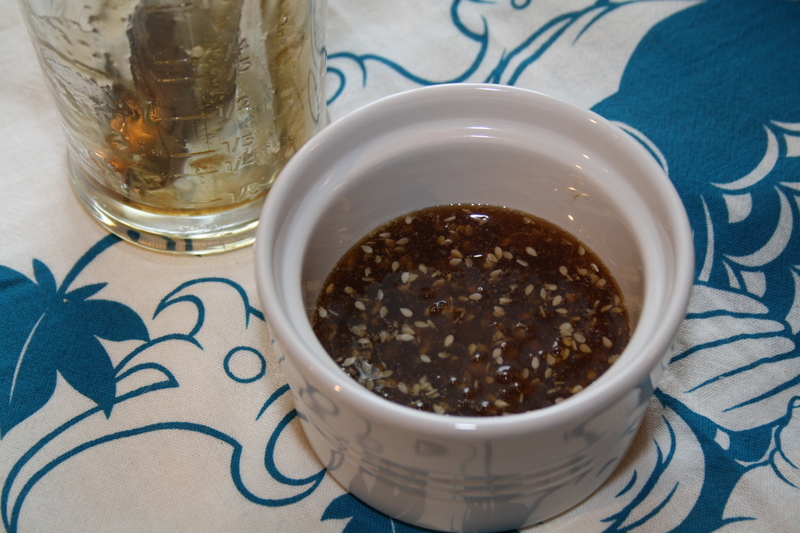 I learned: this glaze is the best part of the dish; do not skip this step; the result is a sweet, tangy, sticky sauce that balances the saltiness of the marinade. It is the bomb. Since I’m really (really!) not good at following instructions, you’ll see in the photos a flub. I managed to convince myself the green onions needed to be part of the marinade, which then of course gets broiled in the oven. Not the case, although truthfully I don’t think it impacted the flavour in the end. The original intent of the recipe was for the green onions to be used as garnish once the fish has come out of the hot oven. I’ll follow that guidance next time, but truthfully, if you happen to flub like me the dish will go on. The majority of Marcus and my work lunches are homemade. I’ve gotten really into packing salads for lunch, with different veggies, nuts, dressings, hummus, cheese, beans, or chickpeas all thrown in a reusable container to work. I’ll open a can of tuna for protein, or use something leftover if we have it. This salmon, torn into pieces over a lunchtime salad, is divine. It’s good cold, and it stands up to other flavours and a dressing of your choosing. An easy leftover that you’ll look forward to. When I was little, salmon was a treat. The ultimate treat. My dad’s not a fan, so my mum would only cook salmon when dad was on a business trip. She would do half of the salmon with a sun dried tomato sauce, and other half simply dressed with lemon and herbs and served with a tzatziki inspired dip. I loved that, and I love this. Fish, any fish really, is easy to prepare, quick to cook, and healthy. And this fresh, yummy salmon has earned a place in the dinner repertoire rotation, as it deserves to be. You can marinate the salmon in either a big resealable baggie, or in a long baking dish like I did. 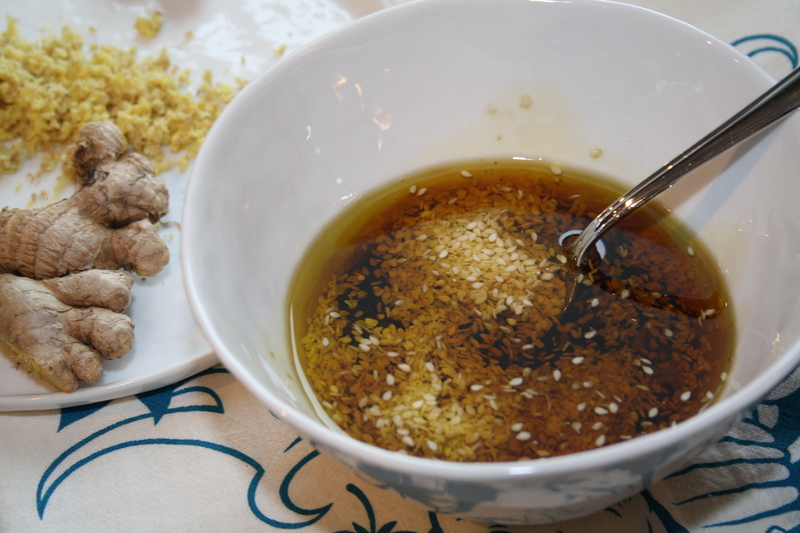 To make the marinade, whisk together the olive oil, sesame oil, soy sauce, garlic, ginger, rice vinegar, and brown sugar. Pour over the salmon, then cover (or seal) and refrigerate for at least half an hour. I let mine marinate about 4 hours. 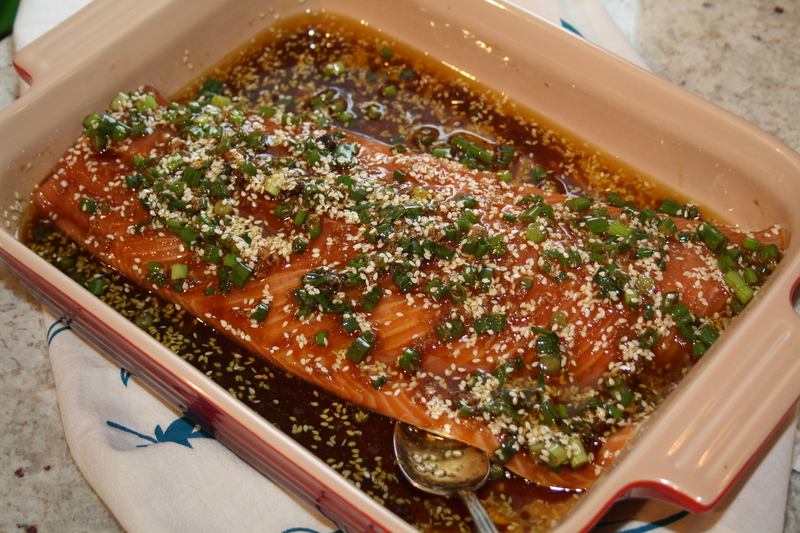 To make the glaze, combine all ingredients in a small bowl and refrigerate until you’re ready to bake the salmon. You’ll want to take the glaze out of the fridge while the salmon is baking so that it can come back to room temperature. Put a wire cooling rack on a baking sheet that’s been lined with aluminum foil. Give the rack a good spray with nonstick cooking spray. Place the salmon directly on the wire rack, and dispose of the marinade it’s been juicing in. Sprinkle the salmon with salt and pepper, then bake in the hot oven for about 15 minutes. You want the salmon to easily flake with a fork. After about 15 minutes, I bumped my oven’s temperature up to 550 degrees and let the broiler do it’s caramelization thing for 2-3 more minutes. 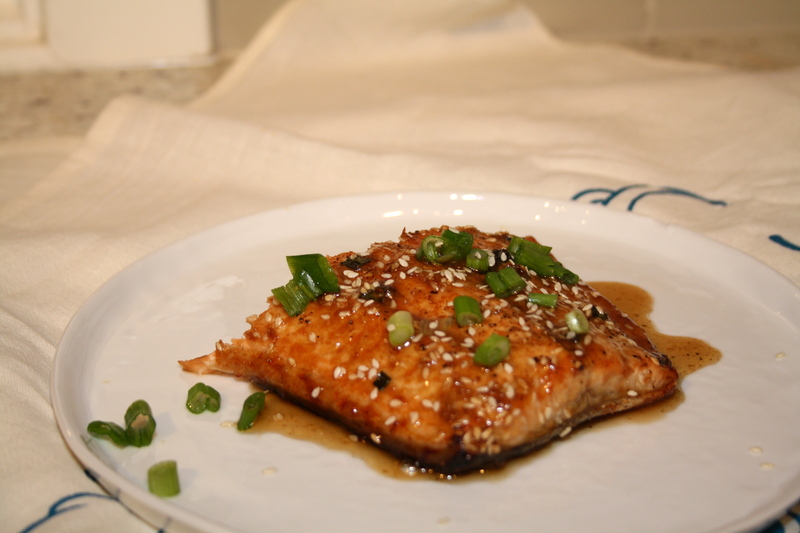 When the salmon is perfectly cooked, flaky yet moist, remove from the oven and immediately garnish with the green onion and pour the glaze over. Serve immediately.